Did I say EDIBLE ???? with a cookie cutter , prick with a fork n deep fry/ bake . palm or a rolling pin . Prick with a fork n deep fry/ bake . Love the look of these mathiri art! will try out at home. Happy Holi! And a wonderful, beautiful, innovative mathri! Lovely and yummy to eat!! Lovely mathris smita... flower power is really powerful for out eyes.. wonderful job dear. Keep going. I just adore your blog! Everything is soooo beautiful!Thank you!!! Happy Holi! These are just beautiful! That's a colorful post...happy holi! 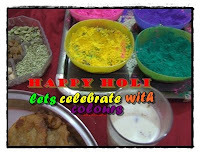 A very happy Holi to all of u . thanks for liking my creations n putting in such lovely comments . So colorful and inviting! Kids will surely love these!